Welcome to our guide for the City Building Freemium Grinder Family Guy: The Quest for Stuff, hereinafter abbreviated as "QfS" to make the reading (and writing) a bit less tedious. You will find that the menu on the right will make it very easy to navigate through the guide and we heartily suggest that you do so. QfS is a City Building Freemium Grinder that is not unlike the perhaps better known and well established Simpsons: Tapped Out. The thing to be aware of is that while Tapped Out is created by game developer EA Games, QfS is created by game studio TinyCo. That fact noted, you should also know that the two games spring from IP that is owned by the same studio, which is to say Fox. 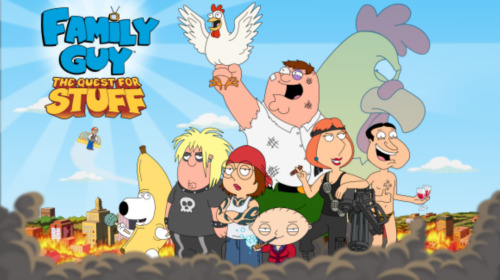 It has been said that QfS is a blatant copy of Tapped Out. This is not true. While it is true that the same basic story and mechanism is used, the actual game play in these games differs considerably and, perhaps more important, they each offer their own voice, experience, and pleasing play style so as to be both similar and different at the same time. There are some issues that we will address in this guide purely to assist you in finding your footing in the economic system being used because, and this is very important, doing so is the key to success in the game. With that said, welcome to the guide, we hope it helps you, and be sure to use headphones if you play this game at work. Just saying.